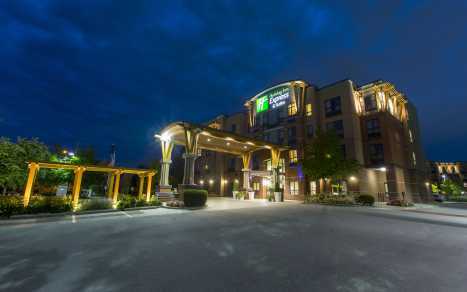 Newest Holiday Inn Express in Richmond, BC with Free: 24hr Vancouver Airport Shuttle, & Hot Buffet Breakfast, & parking & internet & local calls/800 all free. All rooms are large and have microwave & fridge & coffee/tea station. Swimming pool & hot tub & fitness plus Laundry & 24h Mini Mart & 24h business centre. Enjoy convenient access to local attractions & businesses as well as Vancouver and Vancouver International Airport (YVR). Plus we have fun too at the Riverport Entertainment Complex. Our Hotel also has one & two bedrooms, fully equipped suites with fridge, stove, dishwasher, dishes etc.. The parking lot is impressive for Busses & more and the entertainment and restaurants and pubs are plentiful out our door.... Movies, bowling, Ice Rinks, Watermania, to name a few.